Ever wandered what sets the best guitar apart? Or wandered if you could get more out of your guitar investment? It may see odd that as a guitar importer I am featuring an article that is not all about buying a new guitar but about how to get the most out of your current guitar. The reason is I love guitars and I have found that each one is unique. At the same time as a player you have an investment not only of money but time and practice so we are all on this same journey of trying to get the most out of practice time. If you want to get the best out of your guitar regardless of age, of price I thoroughly recommend this thoughtful in-depth article by Dr Tom Chalko. It applies both science and the ancient and proven techniques of violin makers to get the most out of your current guitar in a non-intrusive and reversible way. Dr Chalko’s approach also helps us answer that age old questions, what is a great guitar, which is the right guitar for me? Everyone accepts that strings in musical instruments must be tuned. Guitars Online customer Dr Tom Chalko developed a method of “tuning a structure” of an assembled guitar to improve/optimize its acoustic/performing qualities. The method can improve acoustic performance of classical/flamenco guitars of various designs and age, from traditional and vintage guitars to modern double-tops with exotically braced soundboards. The key advantage of the “structural tuning” method of Dr Chalko is that it is performed on a complete ready-to-play instrument so that acoustic performance improvements can be directly observed at all stages of the “structural tuning” process. This is distinctly different from tuning (tap-testing) individual instrument components before their assembly, introduced by Antonio Stradivari (for violin) and Antonio de Torres (for guitar). Design of a violin allows some structural-tuning when violin is ready-to-play. So-called sound-post in a violin can be moved and its position/design optimized to achieve the best acoustic response. An equivalent option is not available for guitar. The “structural tuning” method developed by Dr Chalko brings a possibility of acoustic performance optimization to the world of ready-to-play classical guitars. Everyone accepts that strings in musical instruments must be tuned. This article explores the concept of “tuning a structure” of an assembled instrument to improve/optimise its acoustic/performing qualities. Results of the “structural tuning” process are presented for 4 classical guitars built from variety of materials using diverse construction strategies: 2 double-top guitars with cedar-cedar and spruce-cedar sandwich soundboards and 2 solid soundboard guitars (1.5mm thick cedar and 2.5mm thick spruce). One guitar had traditional 6-fan braced soundboard, and remaining 3 guitars had soundboard lattice bracing of various spacing, orientation, materials and dimensions. 2 guitars had flat soundboards and 2 guitars had bidirectionally curved (domed) soundboards. After “structural tuning” all 4 guitars turned up remarkably similar in terms of their (measured) acoustic spectral responses to impulse excitation, even though individual timbre of each instrument remained distinctly different during music performance. All guitars significantly improved their performing/recording qualities and became near-flawless - very sensitive and attractive to perform on. Presented results suggest that “structural tuning” has potential to improve acoustic/performing qualities of any classical guitar, regardless of its original/initial construction details or design. The “structural tuning” method should be of interest to guitar makers, guitar repairers and guitar users/performers. Likewise, we can measure many engineering/physical/construction parameters of well-made classical guitars, and then we struggle to determine objectively from these parameters which instrument is “better” than others and why. We can only say which instrument we prefer after we competently performed music on each instrument and heard each instrument in action. The method presented in this article relies on modifying selected (accessible and admissible) guitar structural parameters (soundboard bracing dimensions) to obtain systematic, gradual and permanent improvement of its acoustic/performing qualities. Many structural modification “steps” are made over several weeks. Each “step” involves making small modification to soundboard bracing dimensions, followed by assessment what effect (if any) this modification has on acoustic/artistic/performing qualities of guitar. “Assessment” here means performing music on this guitar before and after structural modification to identify changes in instrument performance and playing it again the next day to make sure that the effect of modification was not temporary or too subjective. Due to subjective nature of guitar quality assessment, the goal of the “structural tuning” method presented in this article can be labelled “scientifically impossible” and “scientifically indescribable”, but it is nevertheless artistically desirable and practically achievable. non-uniform loudness/character of neighbouring notes along chromatic scale. Notes that are louder (or sound different) than nearby notes and notes that are quieter or fail to sustain I consider “annoying”. I play chromatic scale fragments up/down in various positions and tempo on each string to try to identify notes that annoy me because they sound “odd”. Lack of “balance” between instrument registers (bass, middle, treble, high-treble). I take note which register (if any) dominates the sound and which register is weak or “chokes” when compared to others. Note separation in cords, rasguados and arpeggios. I play cords, rasguados and arpeggios in various positions and pay attention how well individual notes can be distinguished. I take note which note ranges are less distinguishable than others. Part of my test involves playing H.Villa-Lobos Study #1 (a 6-string arpeggio study) with varying tempo to explore limits in note separation. Sustain test. I test sustain of each individual note on the fingerboard while preventing other strings from resonating. I note the sounds that have the shortest sustain. It is very important to “get to know” the instrument that you try to tune structurally at every step of its structural modification. The better you know the instrument and the better you remember/understand its performing qualities/flaws – the more effective will be your structural modification decisions (i.e decisions what to modify structurally in any given step) on your path to flawless instrument. Determining what structural modifications are most likely to address specific flaw of the instrument requires knowledge of the specialist engineering discipline broadly called “structural vibrations”. I feel very fortunate to have a formal education in this discipline  followed by several decades of academic/research/teaching/consulting experience , in addition to being competent and experienced classical guitarist . For those less lucky I present below the briefest possible introduction to structural vibrations so that we can proceed with description of the “structural tuning” method for guitars. Every solid structure that has inertia (mass) and stiffness can oscillate around its equilibrium when disturbed. Natural oscillations occur with so-called “natural frequencies” (eigenvalues) and corresponding structural deformations called “modal shapes” (eigenvectors). Each mode dissipates energy of vibration with a rate quantified by the so-called “damping ratio”, embedded in the corresponding eigenvalue. A set of natural frequencies, damping ratios and corresponding modal shapes comprise a complete vibration model of a structure. This model is complete in a sense that any realistic deformation of the structure during vibrations, whether free or forced, can be accurately represented as a sum of “modal shapes” in various proportions. In practical situations, such as in musical instruments for example, we can limit the vibration frequency range of our considerations without compromising quality of our analysis. In a limited frequency range there are limited number of natural frequencies and corresponding “modal shapes”. This is very convenient, because we can study vibrations of very complex structures, such as musical instruments, using quite small number of parameters. Fig 1. illustrates the natural response of simply- supported square plate to impulse excitation, composed from the first 5 modal shapes. If you cannot see animation here, see it online at https://mtbest.net/Fig1.html . Visually speaking, “waves” of different wavelengths, corresponding to different “modal shapes” travel across the plate surface in various directions, overlap one another and “reflect” themselves from plate boundaries while decaying in time. Very similar processes occurs on a surface of guitar soundboard following each and every pluck of a string : deformation waves of different wavelengths, corresponding to modal shapes, travel across the soundboard in various directions, overlap one another while gradually dissipating in time. It is important to realise that all modal shapes are present in this wave movements after each and every pluck of a string, albeit in different proportions for each note and each articulation. Classical guitar frequency range in terms of notes playable on the fingerboard is D2-C6 (73.42Hz- 1046.5Hz). Allowing for harmonics and rounding, we can say that vibrations in the frequency range (0-2000Hz) decide the acoustic performance of a guitar. Fig.2 Holographic interferogram of the first modal shape of guitar G4 made by the author in 1985 at the University of Melbourne, Australia. Fringes connect locations vibrating with identical amplitudes so that the interferogram is an “altitude chart” of the modal shape. The brightest areas show “nodal lines” - motionless locations for this modal shape. In this frequency range guitar soundboards seem to have 20-30 natural frequencies and corresponding modal shapes, so that deformation wave-travelling pattern is more complex than for a square plate in Fig.1. Relationship between vibration amplitude/phase distribution and sound projected by an instrument is complex and different in each auditorium. However, one thing is certain: when guitar soundboard does not vibrate – it does not project any sound. The soundboard must vibrate to project sound. My hypothesis, supported by my experiments, is that the more harmonious and “balanced” are vibration of the soundboard – the richer is the sound that emanates from it. Please consider the above as a key principle of my method. Guitar soundboard without reinforcement is thin and very fragile. 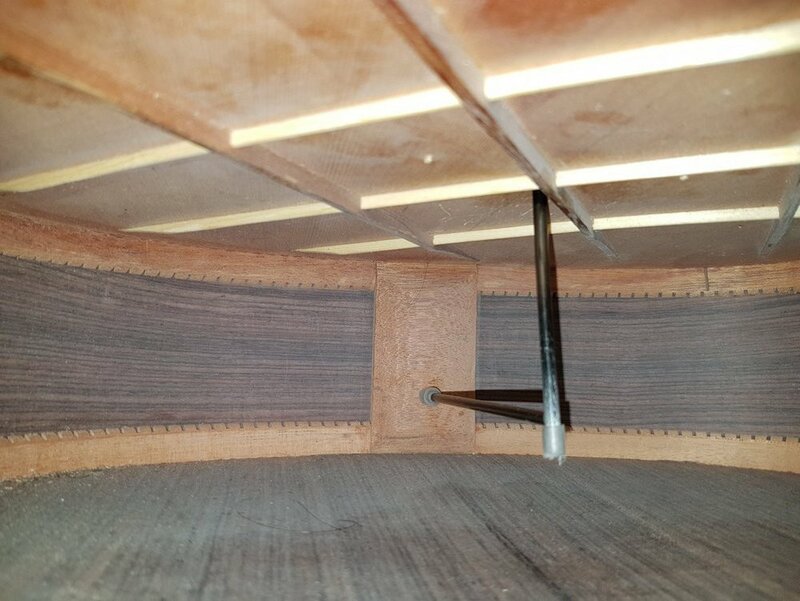 Bracing (a system of beams glued to the underside of the soundboard) is needed to reinforce the soundboard structure so it becomes strong enough to withstand static and dynamic (oscillating) forces from strings and to make the instrument useful. Soundboard bracing is well known to have significant influence on soundboard vibration characteristics and on guitar acoustic performance. History of classical guitar making evolves around various soundboard bracing schemes and recipes developed by trial and error over the last two centuries. Since soundboard bracing is known to have significant effect on guitar sound, it is quite logical to propose bracing modifications in an effort to optimise guitar acoustic performance. During “structural tuning” of a fully assembled ready-to-play instrument, we can only reduce bracing dimensions in specific locations that are accessible via the sound hole. But reducing dimensions of bracing reduces not only its stiffness, but also its strength (load carrying capacity). For this reason, the most important prerequisite for structural tuning is to ensure dimensional stability of the soundboard before, during and after reductions in bracing dimensions. Incidentally, structural stability seems to be a problem of nearly all classical guitars, especially modern top-end instruments. It is a well-known fact that a classical guitar has a “limited playing time” beyond which it begins to deteriorate and requires overhaul. Some luthiers are aware of this and explicitly recommend loosening strings when guitar is not used for playing . Pressed to make louder instruments, luthiers implement progressively more fragile soundboards and more delicate bracing, which is a recipe for shortening guitar lifespan due to accumulating permanent static deformations of the soundboard. When a modern guitar is freshly-made it sounds great. But after ~100 hours of playing its acoustic performance begins to deteriorate. After a year or two, many performers seek another (new) guitar, because they are no longer happy with their ~2 year old instruments. Some performers address this by owning several guitars and tension strings on their best “performing/recording” guitar only for performances and recordings to extend their best guitar peak performance abilities. So, the first task and the most important prerequisite for structural tuning is stabilising guitar structure. I call my method of achieving this “string load balancing”. Fig 3. illustrates the main structural (stability) problem of a classical guitar soundboard. String load F and the counter-acting "bridge holding force" F act in different planes, producing the bending moment F*h that causes the guitar top to bend. This bending deformation (shown above schematically as a red line) accumulates over time, a process accelerated when force F contains oscillating components. This configuration relies on soundboard and its bracing to carry not only static (constant) bending moment, but also oscillating components of this bending moment from vibrating strings that can be quite large. My solution involves installing 2 carbon-fibre tubes 4mm in diameter as shown in Fig 4. Total weight of these tubes is about 4 grams. The vertical tube is installed in a 4mm hole through the bridge, missing bracing beams and string-tying holes. The tube is not glued to the bridge so it can be removed, but the fit is quite tight. The horizontal tube, parallel to strings, is installed under compression to produce force B near the tip of the vertical tube approximately equal to B=F*h/H (see Fig 4. for notation). We can reduce the static component of the bending moment applied to the bridge and the guitar soundboard top to ZERO if F*h=B*H. The tension force in the guitar soundboard behind the bridge then increases by the value B=F*h/H, which is equivalent to a tension force of one extra string. Increased tension in the guitar soundboard behind the bridge and elimination of static bending load noticeably improves guitar sound projection and articulation. It is very important that the vertical carbon-fibre tube is installed perpendicularly to the bridge. I use specially made pre-drilled rig shown in Fig 5. to achieve this. Fig 5. Drilling hole in guitar bridge for vertical carbon-fibre tube using a rig that ensures perpendicular alignment. I use 1.5 mm “pilot” drill first and re- confirm that my chosen location of the hole indeed misses all bracing underneath. I follow with sharp 3.5mm and 4mm drills to make sure that the final hole diameter is accurate. The hole in the bridge does not need to be in the centre of the bridge. In guitars G1 and G4 holes in bridges are between D4-A5 strings and B2-G3 strings respectively to ensure that bracing was not drilled-through. Fig 6. and Fig 7. show carbon-fibre tube system installed in guitars G1 and G3 respectively. On the outside, the inserted 4mm carbon-fibre tube tops are barely visible. 4mm vertical carbon-fibre tube that is ~70mm long below the soundboard needs to deflect about 7mm at the bottom end to produce force B≈60N (equivalent to one string tension) and bring the static component of the bending load on the soundboard to near-zero. This tube is highly stressed where it exits the bridge inside guitar. Steel tube/rod would develop a permanent bend. The only material that can withstand the high static and dynamic (oscillating) bending stress is high density carbon-fibre. It is a good idea to protect the hole exit from wear by gluing an aluminium washer about ~1mm thick and ~3cm2 in the area where the vertical tube exits inside the guitar. Since the vertical carbon tube deflects elastically, it acts as a “spring” and hence does not prevent “dynamic” bending deformations to the soundboard when the soundboard vibrates. Preliminary measurements indicate that the carbon-fibre tubing system adds about 10-15% to the static bending stiffness of the soundboard at the bridge. The single most important property of a musical instrument is an ability to tune it. An instrument that cannot be tuned perfectly is an expensive piece of woodwork that does not really deserve to be called a "musical instrument". Since we aim to achieve a “flawless” guitar as a result of our “structural tuning” we should not neglect string tuning. In fact we should make sounds on all strings perfectly tuned along tempered scale to assist ourselves in detection of sound imperfections that we aim to correct with “structural tuning”. It is possible to achieve perfect tempered scale tuning in classical guitar by means of optimising the bridge support point for each string individually. In theory, the XII fret should be exactly in the middle of the string and give an exact octave. However, when the string is pushed towards the fingerboard, the tension in the string increases and this (of course) changes the pitch. This change of pitch is different for each string in a set due to differences in string tensile stifnesses. G3 string is typically the stiffest and produces the largest pitch changes. My method of finding the optimal string support point on the guitar bridge relies on matching the pitch of the 1-st octave (half-string) XII fret harmonic with the pitch of the string when pressed down in XII position. If they are matched, and fingerboard is of reasonable quality, all notes played on this string anywhere on the fingerboard are tuned in the best way possible along the tempered scale, which can be verified using an accurate electronic tuner. Location of the optimal bridge support point can be different not only for each string in a set, but also can depend on a choice of strings and their tension ratings as well as wear. Embodiment of my solution is a custom designed permanent bridge bone, depicted in Fig 8. Each string has its own “saddle”. The front end of each saddle is adjusted using a small rounded file to adjust length of each individual string if necessary. The depth of each saddle determines the clearance of the corresponding string above the fingerboard (so- called “action” in guitar-player terminology). Action on all guitars were adjusted so that E1 strings were 3mm above XII fret and E6 strings were ~4mm above XII fret. Action at fret I was adjusted to be as low as practical for all strings on all guitars. “Action” of guitar strings (their clearance above frets) influences individual string length (distance between its supports) required for perfect tempered-scale tuning. For this reason, action on all strings (depth of each string saddle) needs to be adjusted first, before individual string lengths are optimised. Of course this is all done when the soundboard is “stabilised” using the “string balancing” described in Section 5.1. Precisely fitted one-piece bridge bone and “saddle” string support provide maximally stiff connection between string and guitar top to maximise the efficiency of transmission of vibrations from the string to the guitar soundboard. 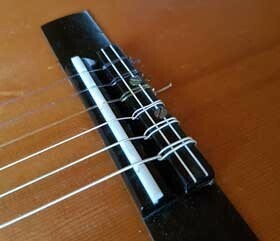 In addition, saddles prevent strings from being squashed at bridge support and losing their brilliance. One noticeable effect of perfect tuning has been the improvement in the ability of guitar to sustain sound. The theory of this effect is quite simple: when notes in chords are in tune, harmonics from plucked strings resonate with harmonics on other strings, maximising the sound energy and sound amplification. In contrast, when notes in cords are out-of-perfect-tune, even very little, the opposite effect takes place: harmonics from different strings disturb (interfere with) one another, reducing the sound energy projected by guitar. While performing “structural tuning”, aiming for “flawless guitar” and learning to observe small differences in guitar performance, I noticed that the method that I used for tying strings to the bridge was not unimportant. Traditional string-tying knots depicted in Fig 9. are elastic. They act as “shock absorbers” that dissipate some energy travelling between vibrating string and the bridge. In technical terms these elastic knots act as “filters” that reduce acoustic spectral performance of each string. Some luthiers (Paulino Bernabe for example) are aware of this and promote using beads (similar to those depicted in Fig 8.) on their top guitars to maximally shorten the string-knot system and hence make the string-to-bridge connection as stiff as possible. An improvement to simple 1-hole beads are 3-hole string tying plates such as Luca Waldner string plates . 3 of my guitars had 12-hole string tying system in the bridge, 2 holes per string. The stiffest knot that I could make was the one when a string coming through the first hole came straight back through the second hole at a sharp 180 degrees bend. I noticed that “stiff-tied” strings could be re-tuned quite fast after being loosened. 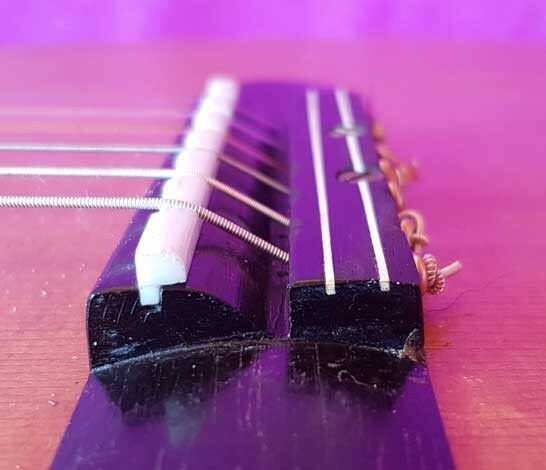 Since I had to loosen and re-tune strings hundreds of times during the “structural tuning” process described further on in this article – bead/plate tying methods saved me time. Fulfilling prerequisites described in section 5 improves guitars quite significantly and makes them a lot more enjoyable to play. Some guitars may not require any more modifications... Structural tuning is the next step for those who want to “make the most” of their instrument by exploring, revealing and maximising their instrument potential. All (prerequisite) modifications described so far in this article were “reversible” and easily adjustable and/or removable. “Structural tuning” is the step which introduces structural modifications that are not easily reversible. Gradual reduction of soundboard bracing beams weakens the instrument in some aspects and at some locations to facilitate improved acoustic performance. The risk associated with weakening selected elements of the soundboard bracing is greatly reduced when the soundboard is “structurally stabilised” by means of relieving it from the duty of carrying static bending load caused by tensioned strings, using the prerequisite procedure described in Section 5.1 of this article. Another risk is associated with “over correcting” the structure, passing the point of the “optimum” acoustic performance. For this reason we need to proceed with caution, carefully assess changes in acoustic performance at each structural modification step and resist temptation of becoming too enthusiastic about continuing structural modifications too far (it is quite exciting to observe an instrument revealing its potential). I found that the single most difficult decision in the process of “structural tuning” was a decision when to stop modifications and accept achieved improvements. 1. Structural modification is made in “steps”. Before each step, strings are loosened to facilitate hand access to the inside of the guitar though its sound hole. After each structural modification, strings are re-tuned and instrument is played to explore changes (if any) to its acoustic performance. Timber needs a chance to adapt to the new structural arrangement and stress. Playing on guitar between “steps” helps the instrument to “settle” faster. 2. Main tools for structural modifications are tiny planers. Acquire the smallest planer(s) you can get and make sure that they are very sharp. Planers facilitate material removal from braces in a controlled way – using very thin (fraction of a millimetre) flakes. a) The soundboard is too stiff or too braced at these locations to accommodate wavelengths of sufficiently many modal shapes to produce a rich sound. Bracing in these locations should be targeted for reduction. I found that some “high harmonic braces” need to be reduced by 95% to activate the “upper bout” of a guitar, especially if guitar has more than one “upper harmonic brace”. 8. Vibrations (and bracing structure) of the “upper bout” (a section of the soundboard on the fingerboard side of a sound hole) decide about the performance of higher note registers and string overtone content (harmonics intensity of strings). Activating the “upper bout” seems critical in achieving a rich tone, increasing sound intensity and expanding the range of articulations across registers. 9. The “lower harmonic brace” seems to have a strong influence on the “balance” between bass and higher registers of the instrument, because it is a “barrier” for waves excited in the vicinity of the bridge that try to travel across to the upper bout. The “lower harmonic brace” can also influence the bass response, especially if it is not perpendicular to strings and extends into the lower bout. You need to understand the basis, logic and limitations of each of the above “rules” to decide a “structural tuning” strategy of your particular instrument. It is difficult to replace a growing “experience” that arises from structural tuning of increasing number of instruments. Structural tuning of the first instrument took me many weeks, which included periods of playing, letting timber settle in new configuration and pondering whether or not to continue structural modifications. The 4th guitar that I structurally tuned (G1) took me about a week before I became fully satisfied with its performance. I was extremely cautious when I “structurally tuned” my first instrument – G4 guitar. I was prepared to “sacrifice” this guitar entirely. It is a $300 guitar that I purchased directly from the maker Rudolf Klier in 1975 when I was a student at a music college and could not afford anything better. G4 guitar has endured multiple damages and repairs in its ~43 years existence and was very unattractive in comparison to my other guitars, even to practice on. Results of “structural tuning” of G4 guitar exceeded my most optimistic expectations. G4 guitar has become a challenge to my best concert guitar... Its sound became exceptionally warm and rich in all registers, almost hypnotically satisfying. Although it was not as loud as my other lattice-braced instruments, the rich beauty of the sound more than compensated for a difference in loudness. I was so excited that I took this guitar to Pierre Herrero , owner of Guitars Online in Australia, who imports and distributes many high-end concert guitars, including some of the best-money- can-buy guitars. After listening to my guitar Pierre suggested that I should write down what I did to my guitar and why. Before I wrote this article though - I decided to implement “structural tuning” to my remaining 3 guitars to gain more experience and a better perspective. After their “structural tuning” I recorded impulse responses of all 4 guitars. Impulse excitation comprised a tap with a miniature silicon-tipped hammer on the bridge near E6 string knot. Strings were damped at 2 locations along fingerboard to prevent them from resonating. Guitars, one at a time, were supported in a stand and their sound response to a tap was measured using Zoom H4n 24-bit digital recorder with built-in microphones. Geometry for all tests was identical. Results of impulse responses were averaged for each guitar to produce spectral responses of guitar bodies presented below. The first graph compares spectral response of all 4 guitars, the remaining 2 graphs compare guitar pairs G1-G2 and G3-G4 respectively so that differences between guitars are easier to spot. Looking at these graphs I cannot resist impression that after “structural tuning” all 4 guitars became “comparable” or “similar” to one another even though their individual differences are clearly visible. All guitars improved significantly their performing qualities after “structural tuning”. G3 guitar seems to produce sound of the greatest intensity of all 4 guitars, is most sensitive to play on, has the widest range of articulations and the loudest harmonics. Vintage guitar G4 has the warmest/sweetest sound of all guitars, but is a little quieter than others. G1 and G2 guitars seem to balance all qualities in all registers in their own way. There exists an alternative to purchasing/making/designing a better classical guitar: taking your existing instrument and making the most of it using the “structural tuning” method outlined in this article. Each guitar has different “limits” to what is practically achievable as a result of “structural tuning”. My implementation of “structural tuning” to 4 guitars indicates that each instrument retains its individuality while becoming significantly better and more enjoyable to play on. The key advantage of the “structural tuning” method presented in this article is that it is performed on a complete ready-to-play instrument so that acoustic performance improvements can be directly observed at all stages of the structural tuning process. This is distinctly different from tuning (tap-testing) individual instrument components before their assembly, introduced by Antonio Stradivari (for violin) and Antonio de Torres (for guitar). Violin allows some structural-tuning when is ready-to-play. So-called sound-post in a violin can be moved and its position/design optimised to achieve the best acoustic response. An equivalent option is not available for guitar. “String load balancing”, a carbon-fibre tube system described in Section 5.1, increases performance, structural stability and longevity of guitar, whether or not it is followed by “structural tuning” optimisation. allows mass-produced student guitars to become better. Manufacturer can “structurally tune” several instrument samples from the production line and see which structural elements need to be improved/modified. I wish to express my gratitude to Pierre Herrero ( Guitars Online ), who allowed me to play on the best guitars from his extensive and ever-expanding guitar range over the past 3 years. This unique and unforgettable exposure to the world of best guitars has enhanced my awareness of guitar sound, boosted my ability to compare instruments and inspired me to make a contribution to guitar design summarised in this article. I am grateful to Pierre for his suggestion to write this article and his offer to publish it on his Guitars Online website.